In 2006, the barn from the 1927 image has a steel roof, and a couple of additions. 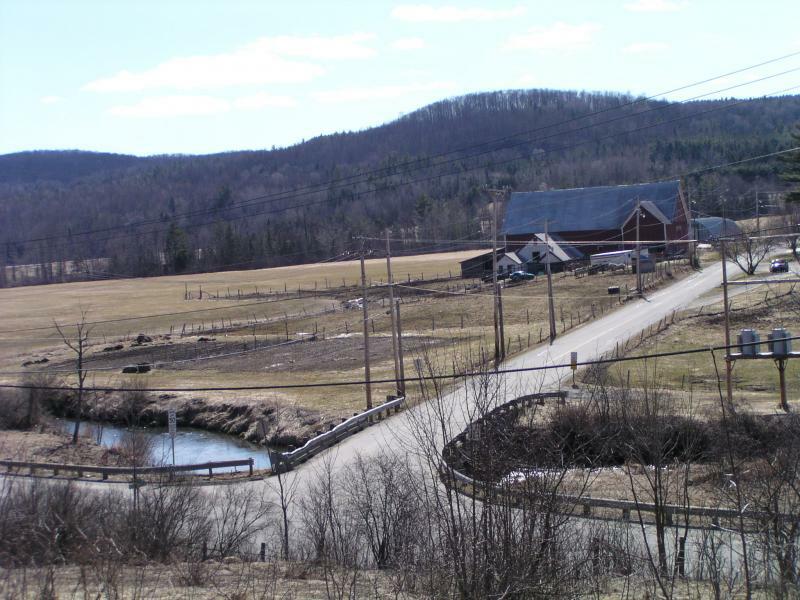 The bridge and fencing at Glover Road and Roaring Brook Road are repaired from the Flood of 1927. The once tall trees from 1927 in the foreground are gone, but the ridgeline in the distance seems to be hosting a denser forest in 2006 than in 1927. This image shows an intersection of two paved roads. One road parallels the river and the other crosses the river with a small bridge. A red barn and a few horses can be seen as well as a few vehicles. Beyond the barn is open land continuing into a forested hillside. Many power-lines are visible. Two speed limit signs are posted next to the roads. The riparian zone is barren. Photo shows flood damage in Barton. 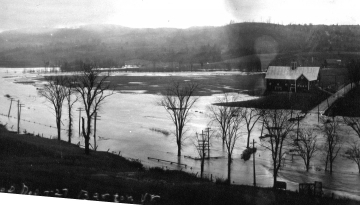 Note the submerged wooden fences and fields. Loona Brogan writes on 2006-12-08: The tall, vase-shaped leafless trees along the edge of the river are all American elm. The shorter trees may also be elms.